A 26-year-old female patient is treated following the "MeteenDoor"- protocol. 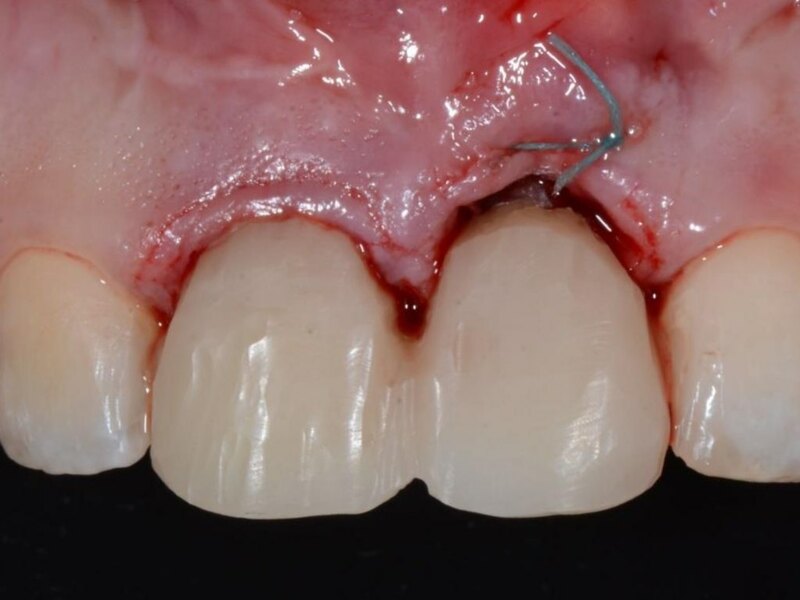 This Dutch protocol includes the placement of a bone substitute simultaneously with Immediate Implant Placement and Provisionalization (IIPP) reducing the horizontal buccal bone changes. 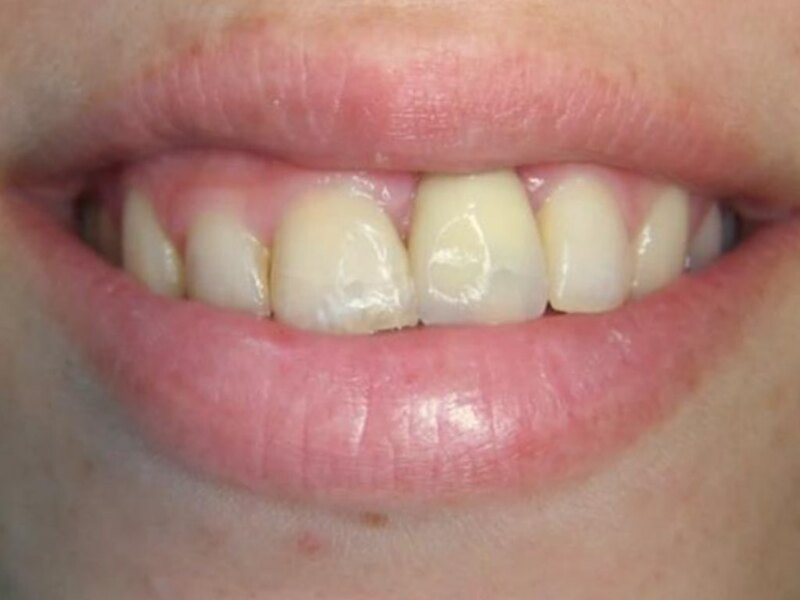 It is a predictable treatment procedure where the midfacial recession is avoided when a previous dental element is directly replaced. The #21 FDI (#9 US) was a Straumann implant, placed in a delayed procedure and temporarily restored when she was referred with a lost #11 FDI (#8 US). The referral asked to replace the #11 FDI (#8 US) immediately. 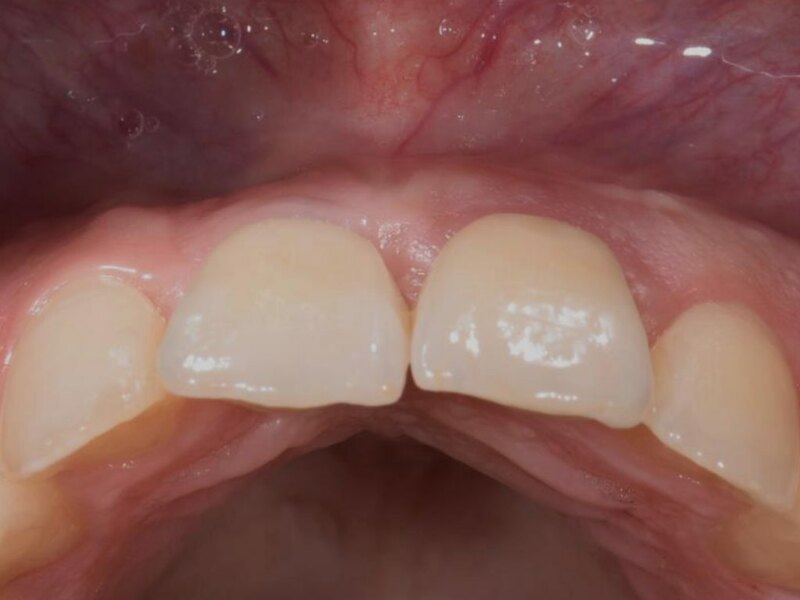 To achieve optimal functional and aesthetic results after implant installation in the anterior maxilla, correct implant positioning and establishment of an optimum volume of hard- and soft- tissues are crucial. 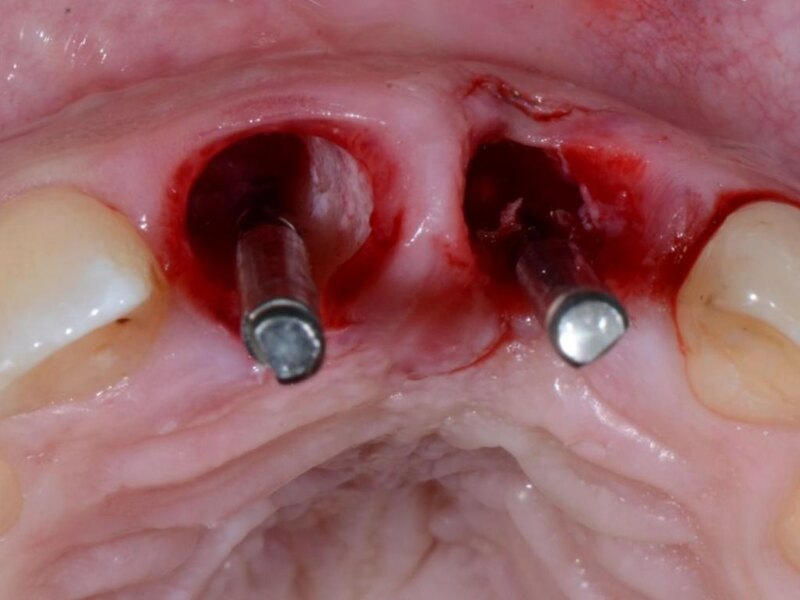 Because of the midfacial recession the decision was to replace the implant #21 FDI (#9 US) in the same session following the same "MeteenDoor" procedure. 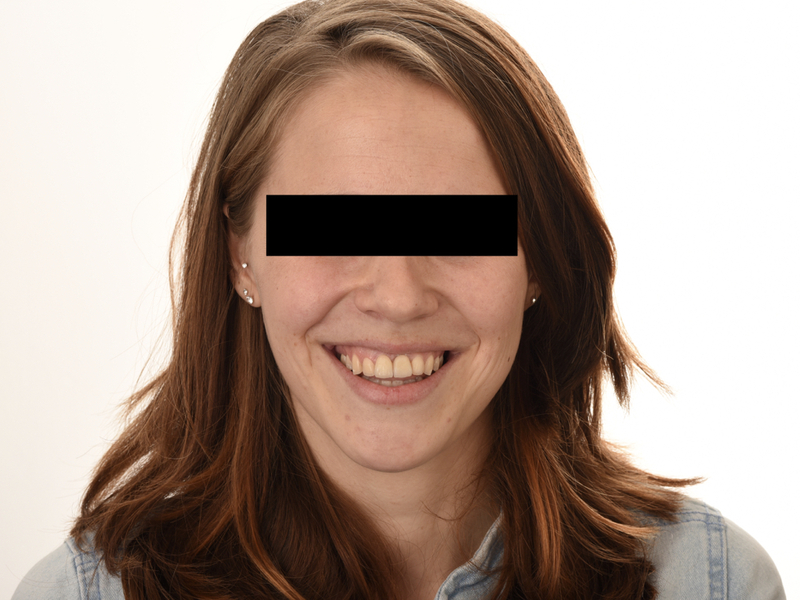 In this procedure, midfacial height was gained without opening a flap or performing a Connective Tissue Graft (CTG). 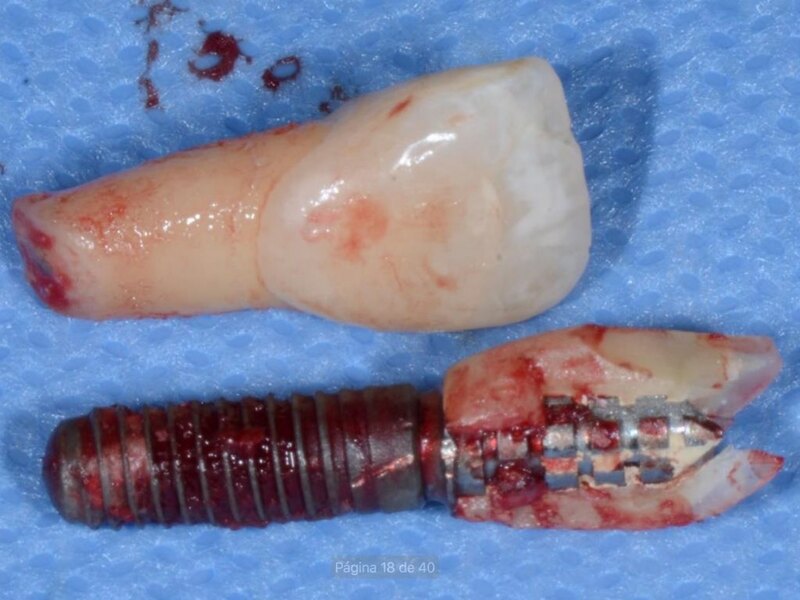 The assumption was that this would be the same as replacing an implant instead of a natural tooth. For the provisionalization, "Dutch Design" temporary abutments were used. 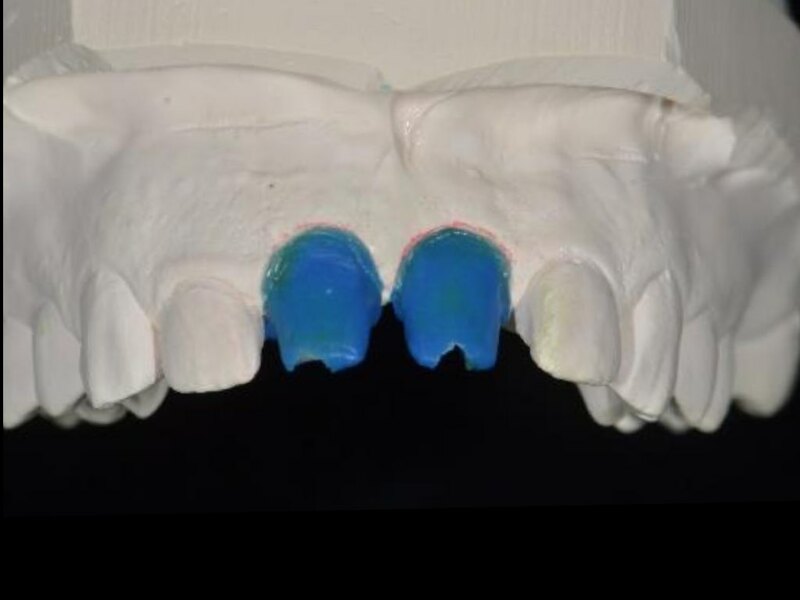 These are sterilized NobelProcera titanium abutments with resin (BisGMA) temporary restorations. 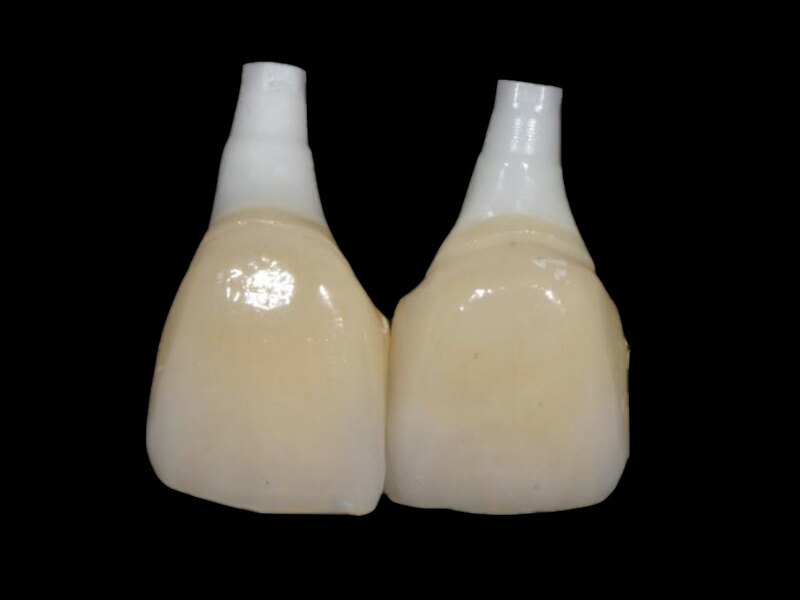 For the final restorations, NobelProcera ZirO2 abutments were used overpressed with E.max press and partial E.max crowns with supragingival outlines. Incisal view of the central incisors. 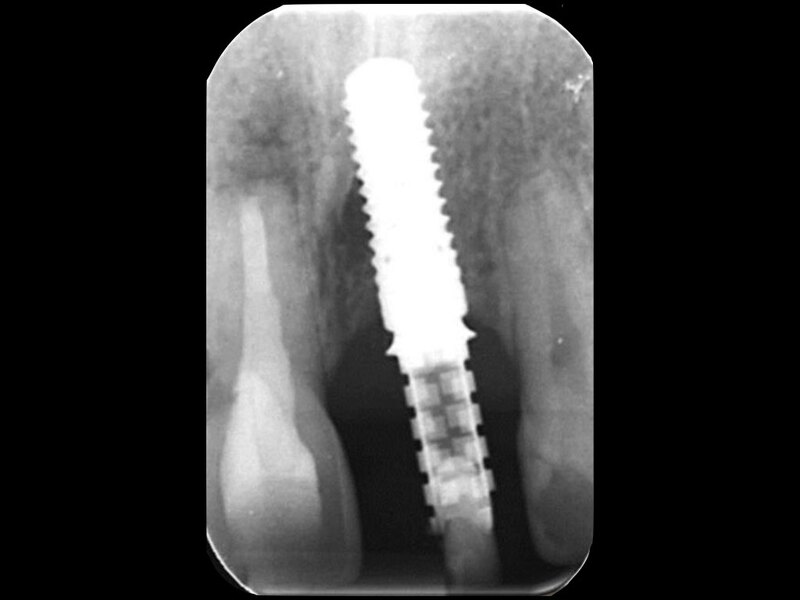 Periapical X-ray of the implant. Smile analysis of the frontal incisors. 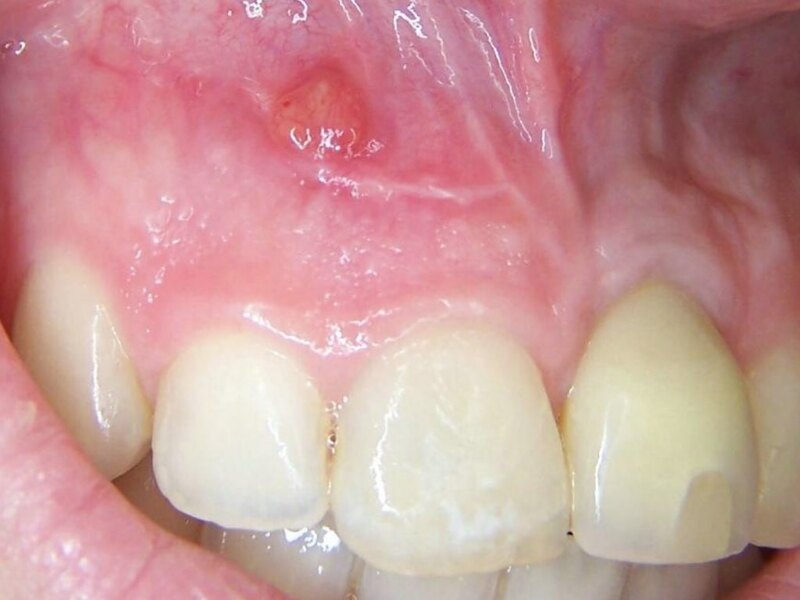 Periapical X-ray examination, the central incisor presents an apical lesion. 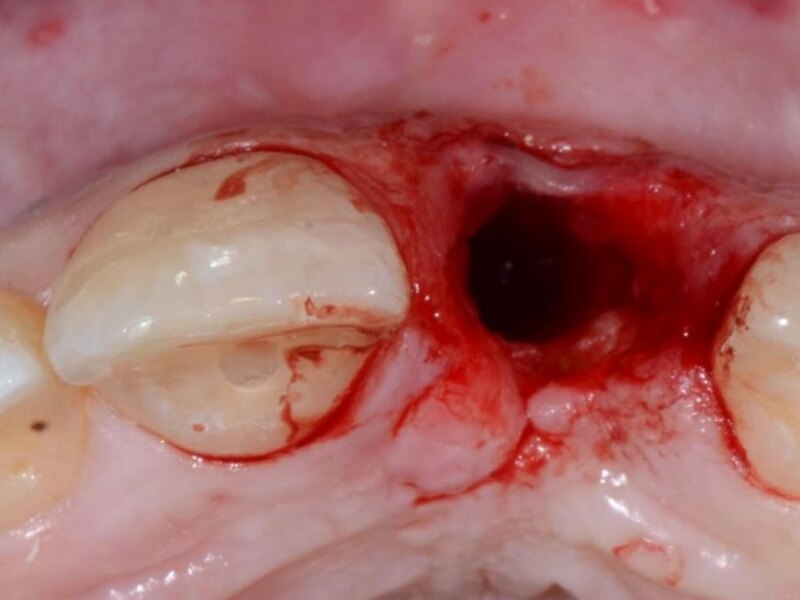 Intraoral view with a fistula on the central incisor. 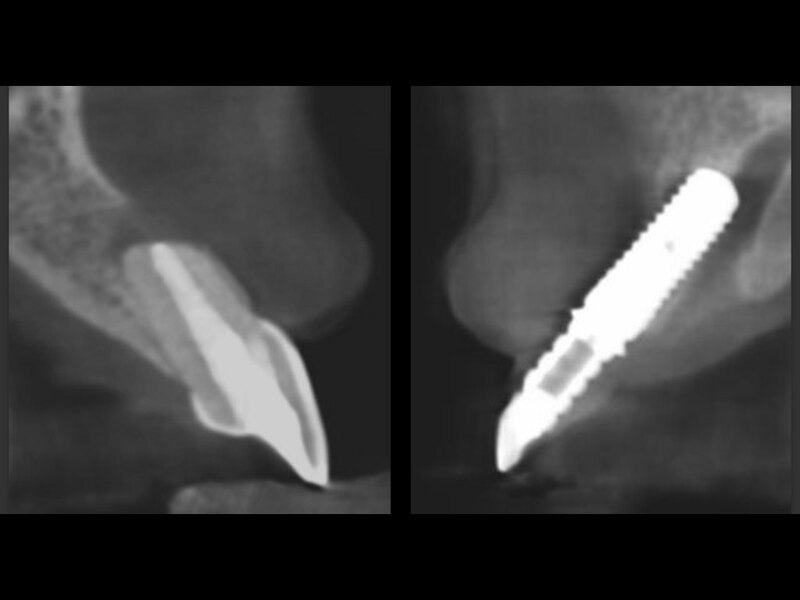 A CBCT scan with a standard dose, and a small field of view (FOV) of 6 cm by 6 cm was made, to decide if Immediate implant placement (IIP) was feasible. 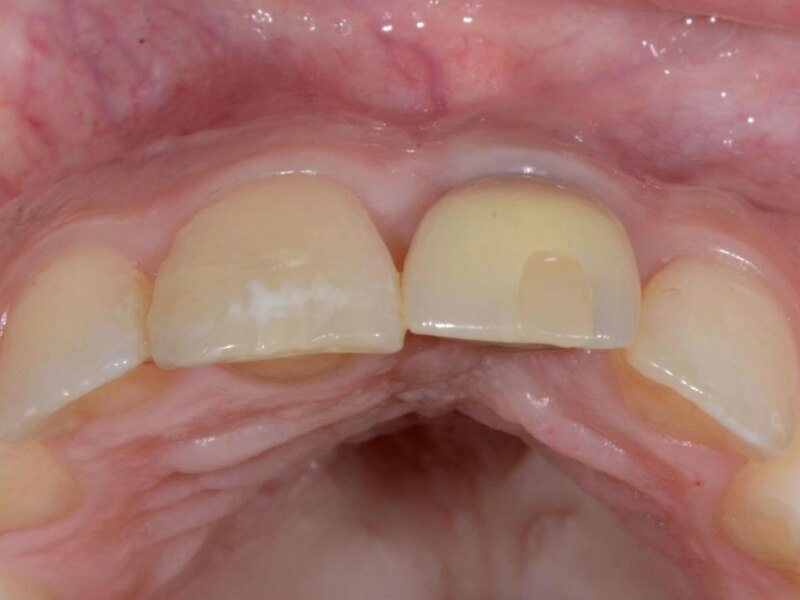 An absolute prerequisite for IIP is the presence of sufficient palatal bone volume to offer the implant sufficient primary stability to allow immediate restorations. Occlusal view of the situation during explantation. 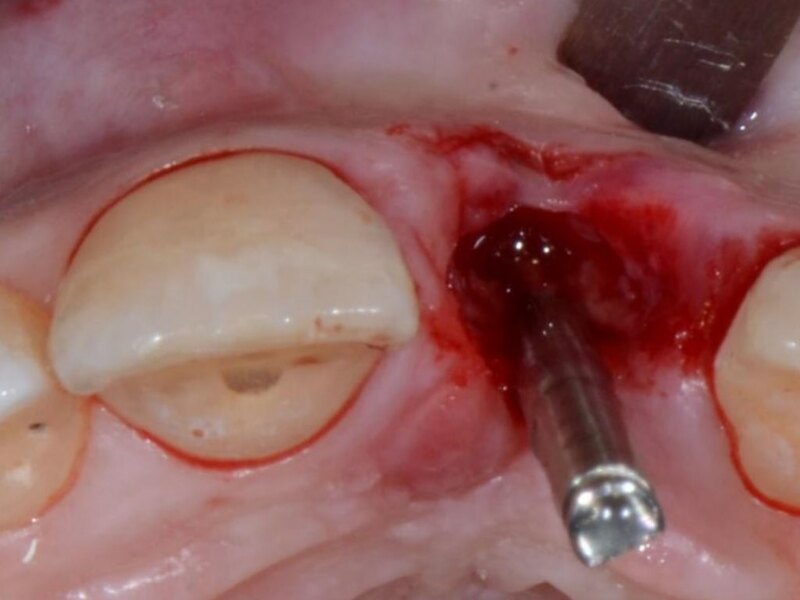 Occlusal view of the socket after the explantation of the implant in #21 FDI (#9 US). 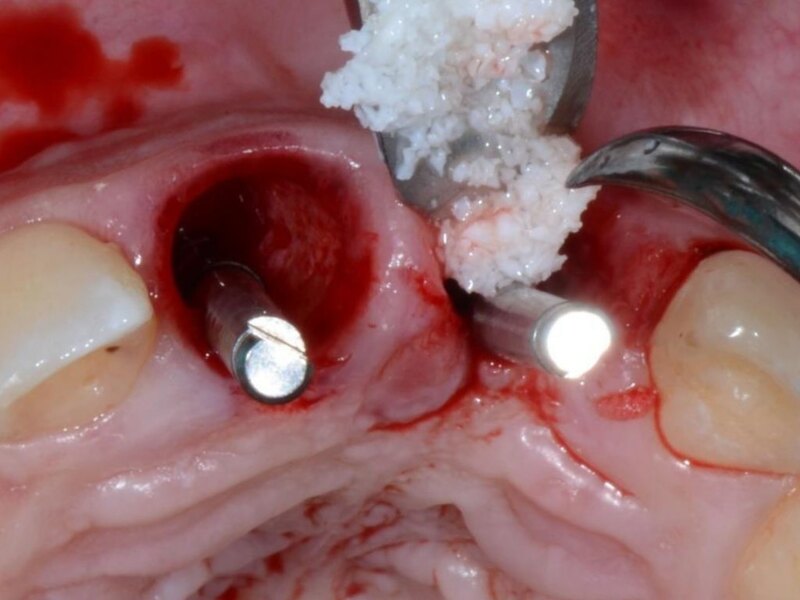 Intraoral view, correcting the position of the implant according to the arch. Atraumatic extraction of #11 FDI (#8 US). 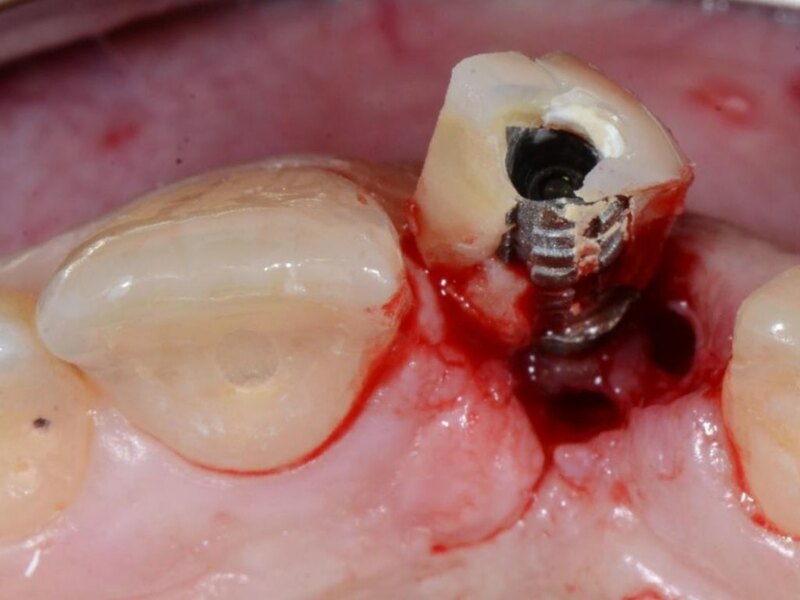 Central incisor tooth and implant of the #21 FDI (#9 US). 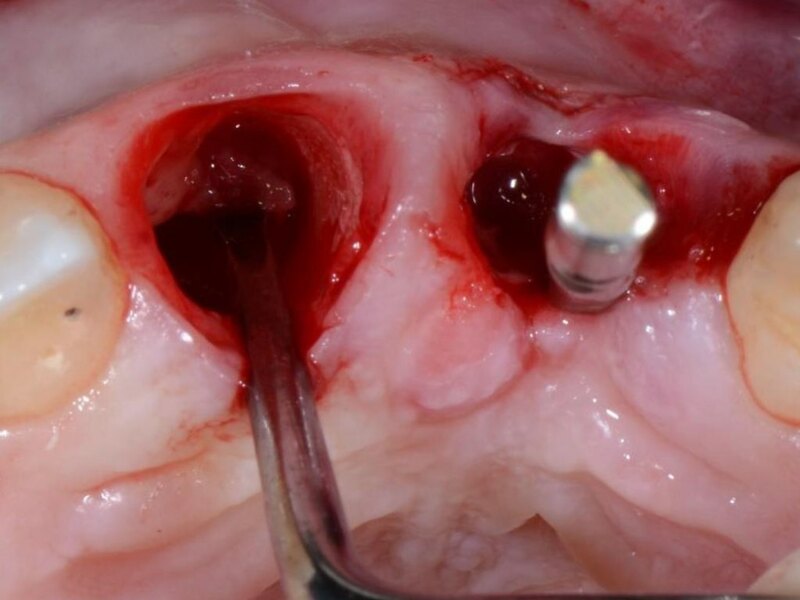 Intraoral view, the socket was cleaned extensively using a bone excavator to remove remnants of the periodontal ligament and/or inflammation tissue and to promote bleeding. The last used drill was placed and the bone substitute was applied. 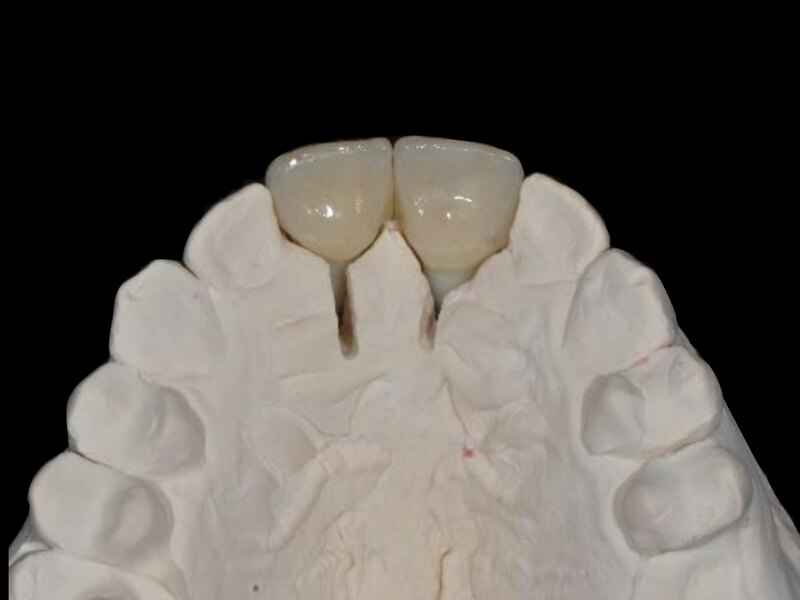 Occlusal view to evaluate the parallelism of the implant position of the central incisors. 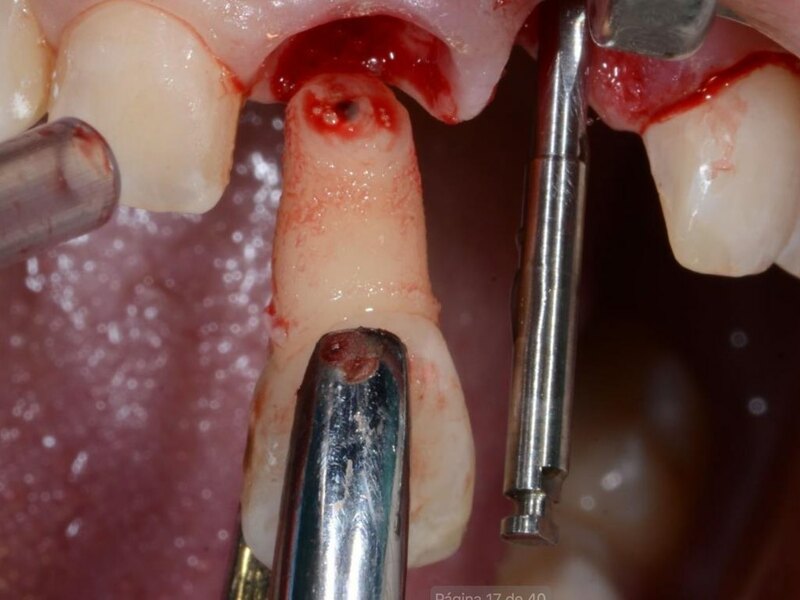 The implant sent was positioned 3 mm deeper than the buccal gingival margin. 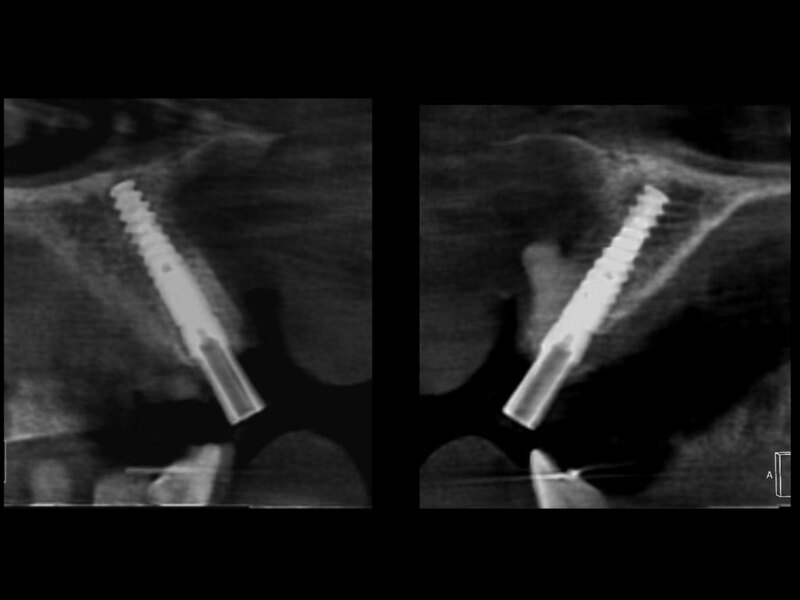 Immediately after this flapless surgery a second small Field of View (FOV), low-dose CBCT scan was made to evaluate the implant position. 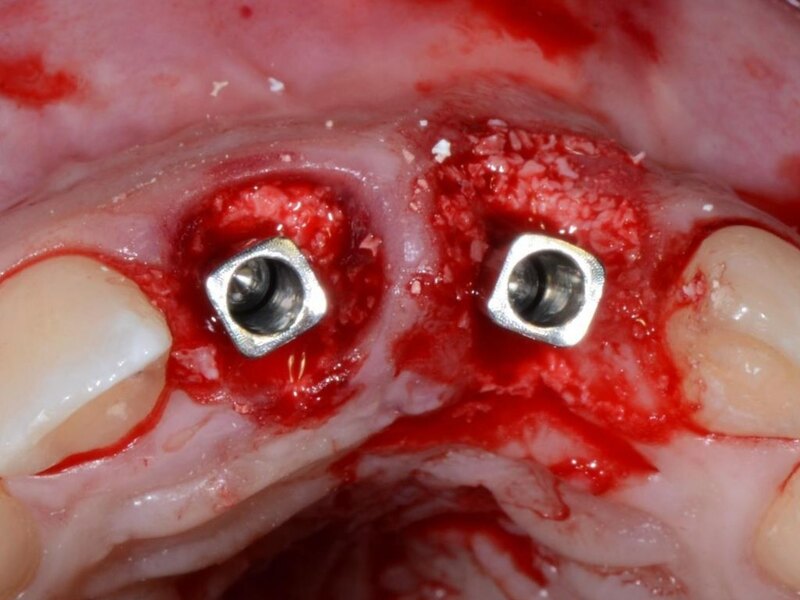 A titanium temporary abutment was positioned onto the implant that allowed the fabrication of a screw-retained temporary crowns under cofferdam. 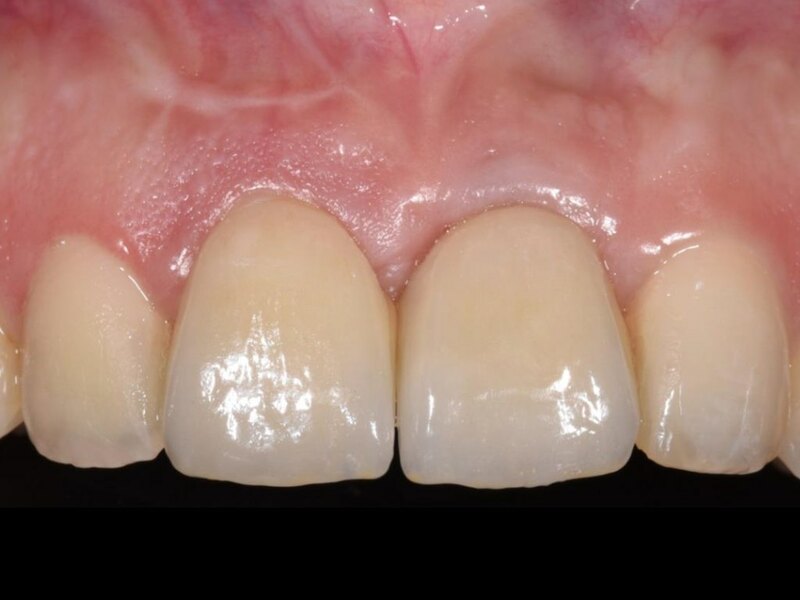 Intraoral view of the provisionals over implants on the central incisors. 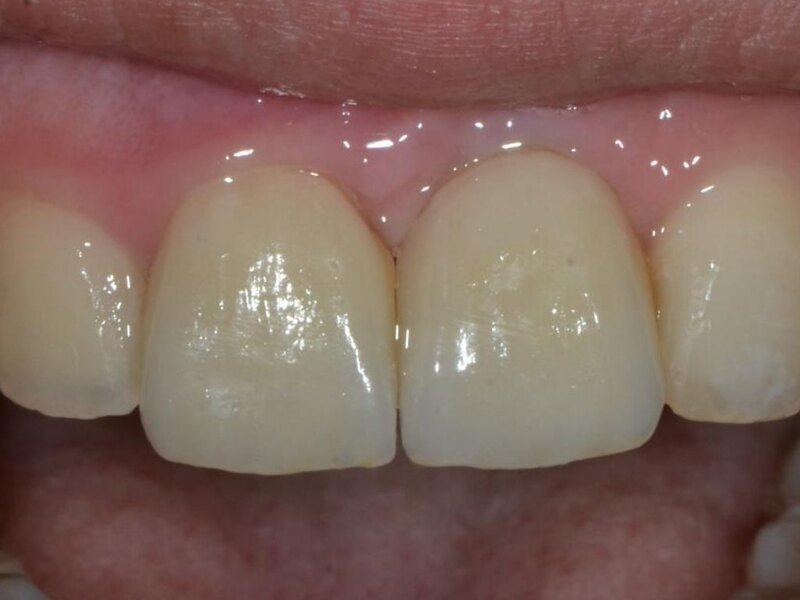 Six months later follow up of the provisional over implants. The crowns over implants were fabricated. 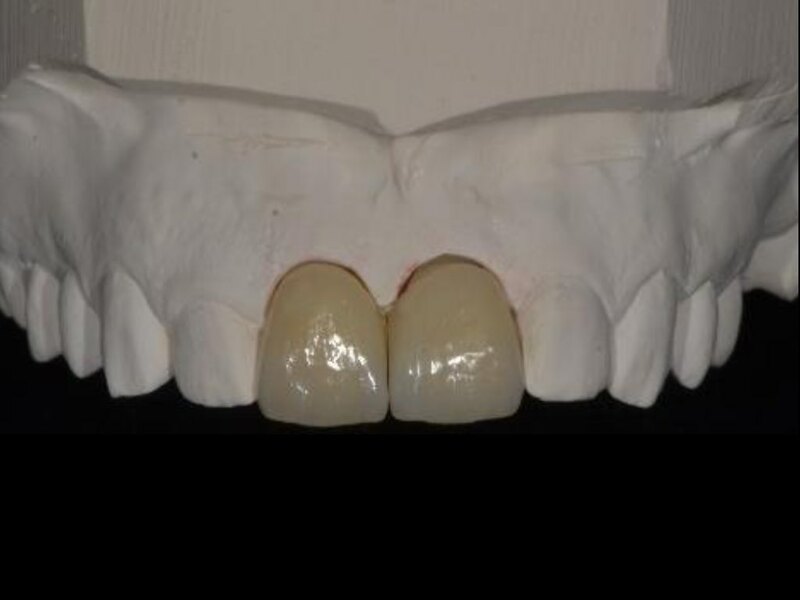 Palatal view of the crowns over implants. 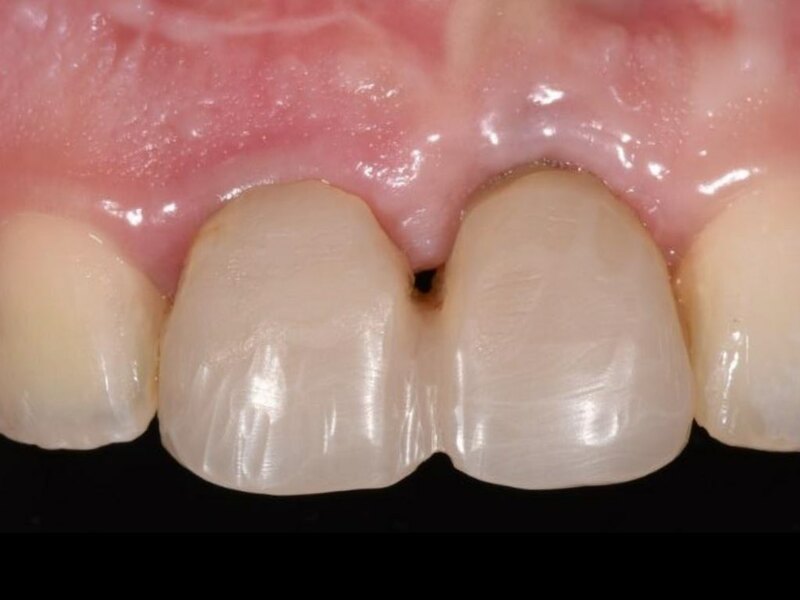 In the final restorations, NobelProcera ZirO2 abutments overpressed were used. 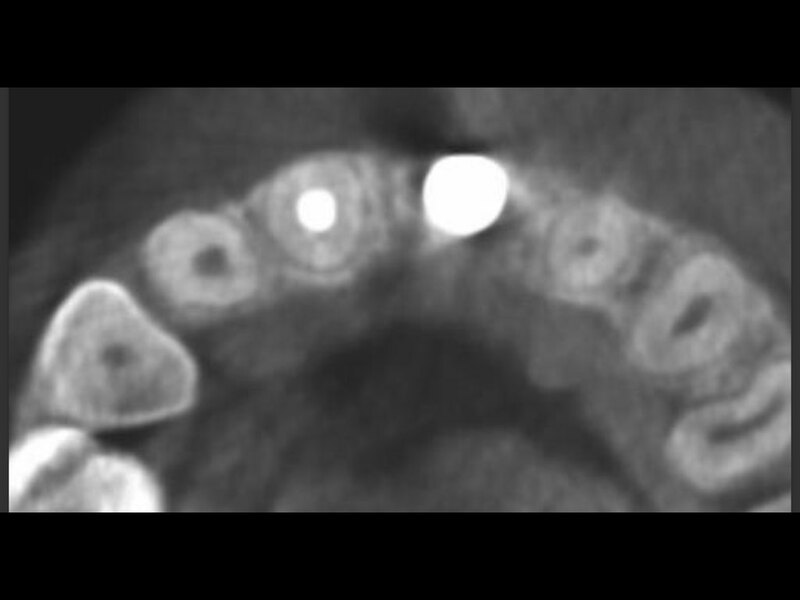 Palatal view of the ZirO2 abutments. 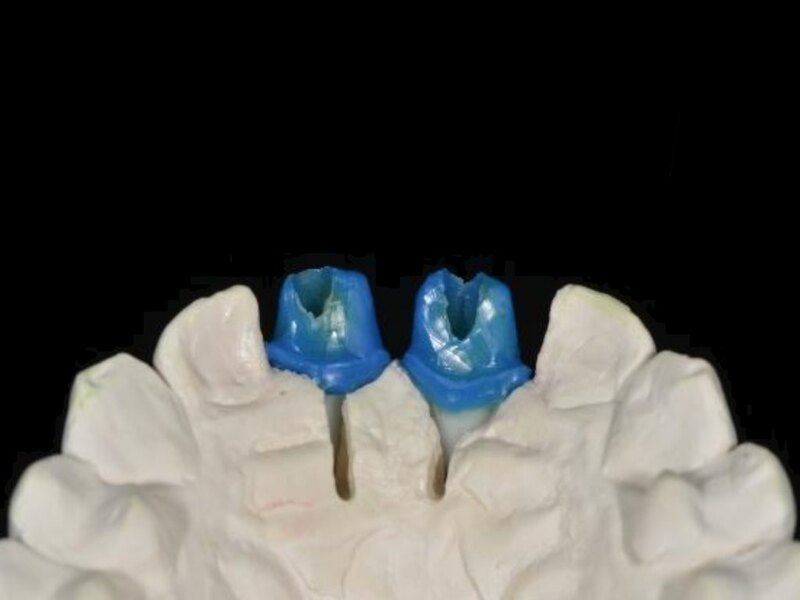 NobelProcera abutments overpressed with E.max press and partial E.max crowns with supra gingival outline. Lateral view of the final restorations. 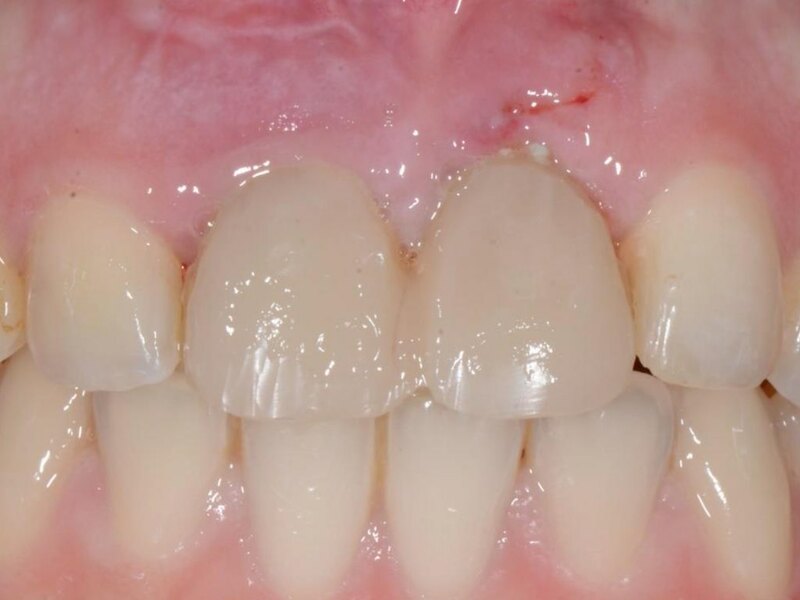 Intraoral view of the final restorations placed on the upper central incisors. 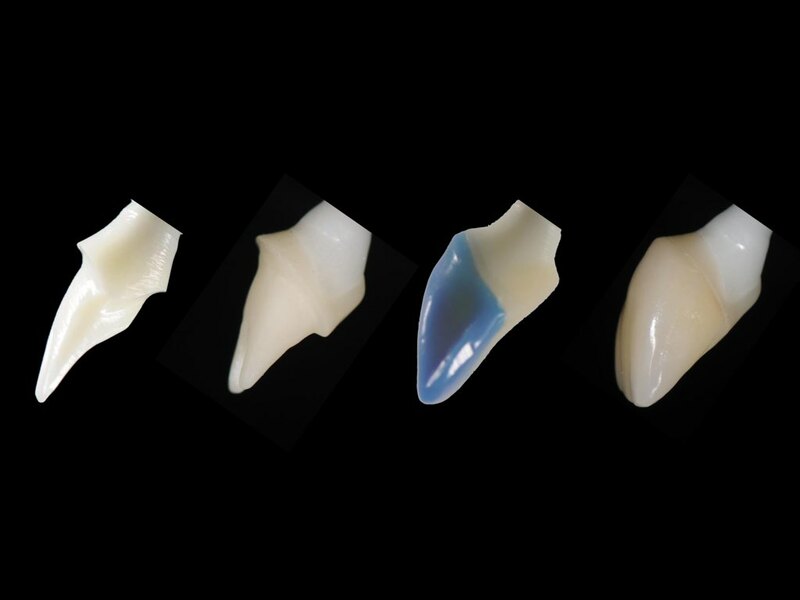 Smile analysis of the final restorations placed. 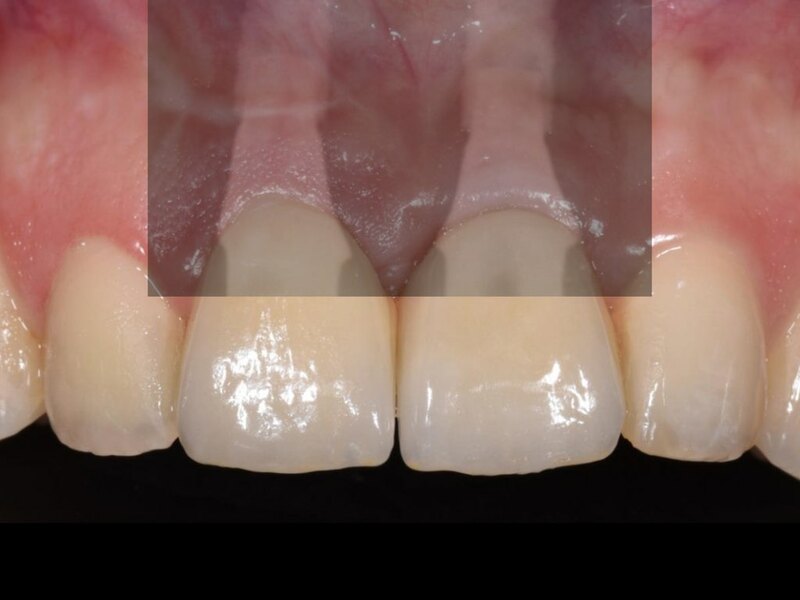 Follow up of the crowns over implants in the central incisors. 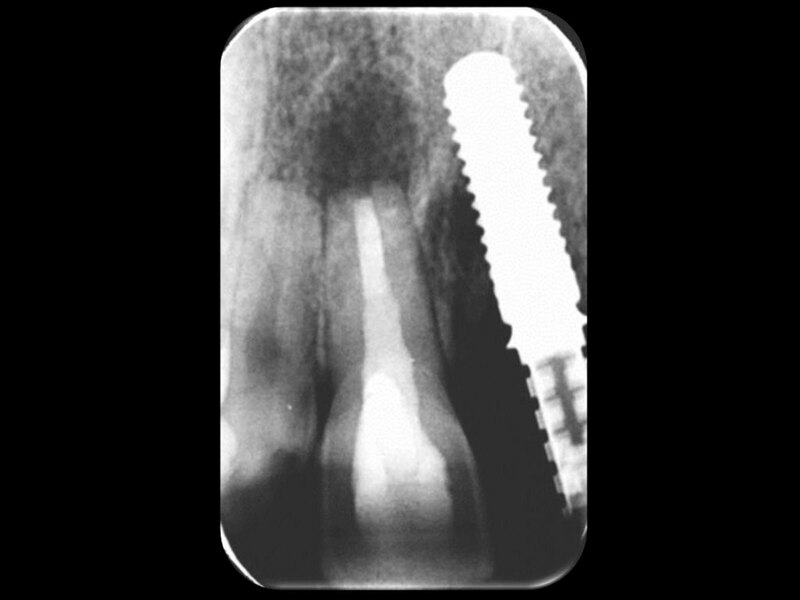 Superposition of the periapical x-ray according to the final intraoral picture. 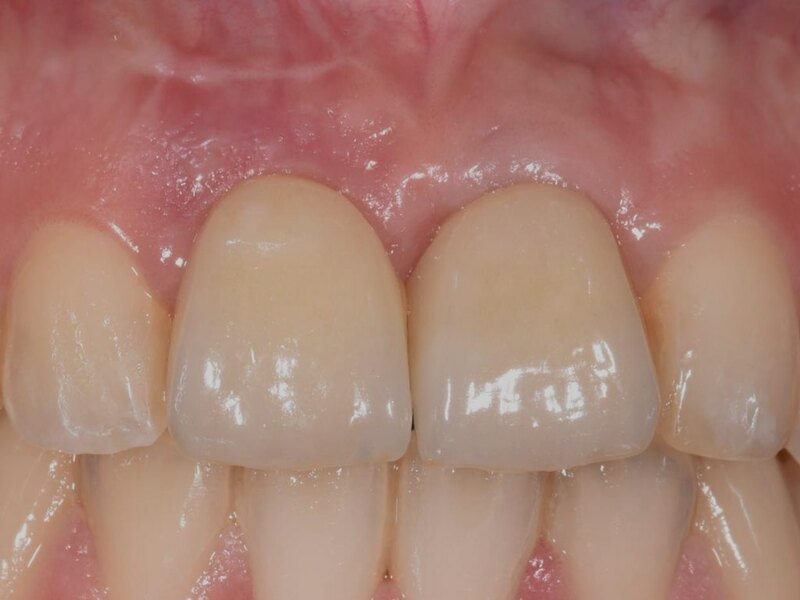 Occlusal view of the final restorations. 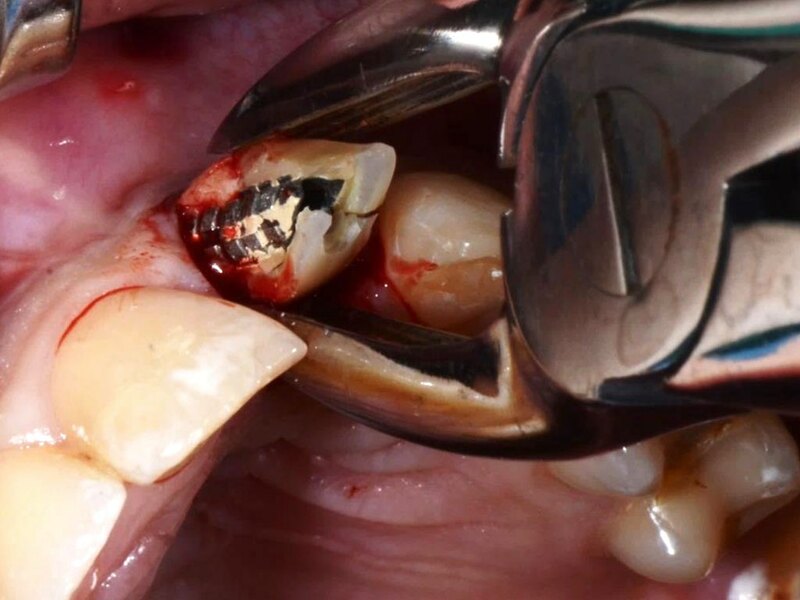 Intraoral follow up of the crowns over implant. 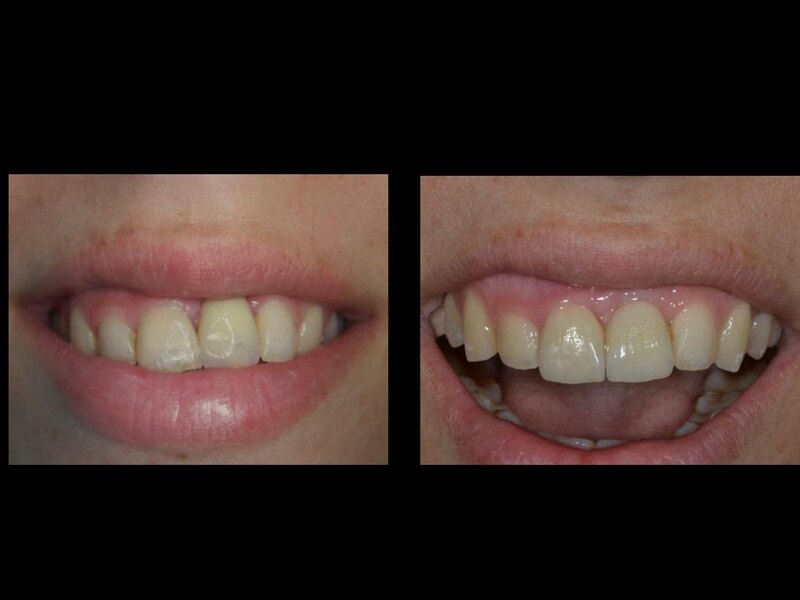 Smile analysis of the final restorations after several months placed.